Therm-ic battery boot heating systems are designed to combat sub-zero temperatures and ensures that your winter sport experience is enjoyable. The Therm-ic boot heating system is easy to use, easy to install and suitable for any boot. The Perform insoles have extra support and comfort than the Classic insoles. The heating elements are pre-wired in the toes and are easy to install. • Quick and easy installation! 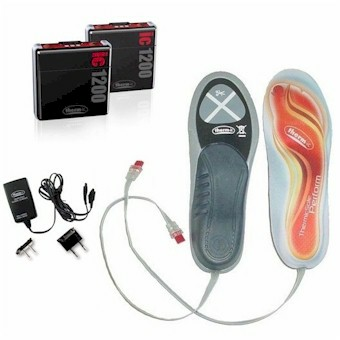 The Perform insoles have the heating elements pre-installed in the toes. All you need to do is remove your current insoles, trim to size, install in boots, plug in and turn on. Fits all types of winter boots and installation only takes about 30 minutes. • Comfortable warmth with up to 22 hours with freshly charged batteries. • The SmartPack 1200 lithium ion batteries can be charged up to 1000 times. • You have 3 settings of heat that allow you to determine how much heat you want and determine how long your batteries last. • Low setting: 37 C or 99 F for 16 - 22 hours of use. • Middle setting: 113 F or 45 C for 7 - 10 hours of use. • High setting: 70 C or 158 F for 3 - 4 hours of use. • Time of use depends on the charged status of the batteries, the age of the batteries and the outdoor ambient temperature. For longer battery time, don't leave your batteries on all day. For instance, turn your batteries off when inside for break or lunch. • Instructions booklet on how to use the batteries and charger. • 2 SmartPack 1200 Lithium-ion batteries with clips. Both batteries have integrated heat stage switches. • 2 Perform insoles which are anatomicly 3D shaped insoles taht offer great support for stability and balance. The Perform insoles are made of high quality EVA foam and have the heating elements pre installed into the toe areas. All you need to do is remove your current insoles, trim the Perform insoles to the same size and slide the Perform insoles in. You can opt to run the wire for the battery right up the back or put a small slit in your boot liners and run the wire between the liner and shell. (We recommend the later.) It takes less than 30 minutes to install. • Therm-ic offers a 1 year warranty against any manufacture defect.